Ready to Eat Sandwiches were originally developed for the United States Military as combat rations for troops on-the-go. The Military required a sandwich with a three year shelf life, that tastes as great on day 1,095 as it does on day 1! 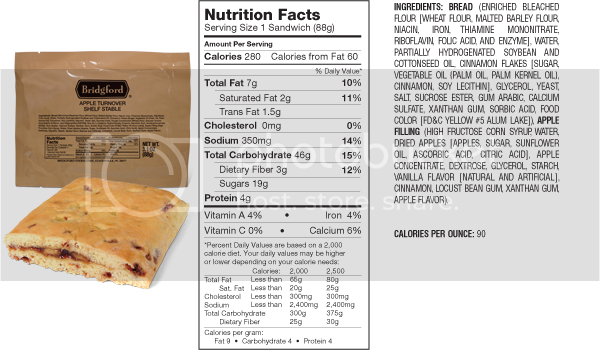 Our Ready to Eat Sandwiches were also tested with the United States Marines during an operation in Fallujah, and are currently incorporated into the US Military "First Strike Ration" MRE. Bridgford Ready to Eat Sandwiches are produced in our Statesville production facility, under a grant of inspection with the USDA/FSIS. We are also inspected by the USDA/AMS, FDA, NCDA, VETCOM, Silliker and a handful of other agencies. All of the meat and poultry that we use is purchased from USDA facilities and BSE tested to ensure the highest quality. All Bridgford shelf stable sandwiches have a 3-year shelf-life if maintained at 80 degrees or less. Sandwiches can be stored at 100 degrees for six months. AS IS: Tear open the pouch at tear notches. Remove Sandwich and eat. MRE/FLAMELESS HEATER: Place unopened pouch in MRE/Flameless Heater and follow the MRE/Flameless Heater heating instructions. Tear open the pouch at tear notches. Remove Sandwich and eat. BOILING WATER: Immerse unopened pouch in boiling water for 6 minutes. * Tear open the pouch at tear notches. Remove Sandwich and eat. What is put in the sandwiches to make them stand up to shelf life? It's a combination of packaging and processing. In terms of packaging no light breaches the tri-laminated foil pouch and no oxygen is contained with in the package and hence no bacteria formation. In terms of processing sodium is utilized in the preservation of the product however the product contains less than a can of soup. Are there any made with gluten-free breads?